I am amazed at how much I really enjoy the new Marvel Heroic Roleplaying game1. When I look at my game play history, the superhero genre never really excited me. Maybe it was those first few attempt at playing supers games. I attempted a brief run of Champions back in high school. In the one session we played, one of the heroes was “about two minutes away” from the scene were the battle was going on. It took him about three hours of play time before he arrived on the scene. That sort of sucked. Another Champions game had me playing a hero that grew like your Giant-Man/Goliath/Atlas characters. Unfortunately, we didn’t realize that the growth power didn’t come with added resistance from being shot with a gun, so Tower just grew 40′ tall and was taken down by an Uzi. That sort of sucked, too. Oh, and I played one game in the old Marvel FASERIP game that everyone seems to love: I was playing Captain America and the rest of the Avengers were going into Ultron’s dungeon crawl fortress and there was a covered pit trap and everyone managed to jump over the pit. Except Captain America.2 That was just stupid. 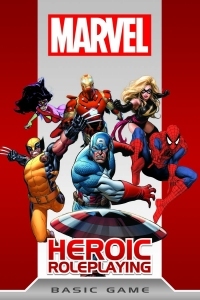 Then now, over two decades since I played a superhero game, along comes Marvel Heroic. Our game group has a game we really want to play, but it’s still in development. So instead, we decided to play Marvel Heroic while we’re waiting for that other game. And after only two game sessions, I would be okay if we stuck with just running Marvel for a very long time. Why? Because it’s brilliant. The character stats are absolutely fantastic: it models what your hero does instead of going into the excruciating minutiae of how the character is built together. This is a game where you can have DareDevil and Thor on the same team and not have to worry about Thor defeating dozens and dozens of badguys while DD is tangled up with two thugs with crowbars. The plot point/doom pool resource management minigame is fun. The action is fast and frentic. All the distinctions, resources, assets, and complications add in the stuff I loved about Dresden Files3. We’ve got game night tonight, where I’m sure Captain America won’t fall down a stupid hole in the floor. In truth, the only thing I don’t like about MHR is the image of Wolverine on his datafile. It looks like Logan is taking a dump. Thanks for this set of cheat sheets! Immensely helpful. Game night over. Nobody fell down a hole. Except Carnage, and technically that was an elevator shaft. Your cheat sheet is great! I spotted an error, though. On p.4, you say that ties go to the defender. Actually, ties go to the attacker. The reaction roll needs to beat the action roll, not just meet it. Thanks for the catch, Buzz! When I reworded the succeed/fail bit on page 4 to key off of the action roll instead of the reaction roll, I smurfed where the “is equal to” should go. It completely makes sense in a comic book game where you want to have more actions succeed and look impressive on the page than not. Otherwise, you’ll just have Captain America falling down a hole in the ground too often. I’ve updated the document.